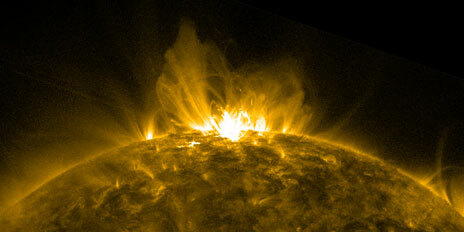 (Nanowerk News) Strong solar flares can bring down communications and power grids on Earth. By demonstrating how these gigantic eruptions are caused, ETH physicists are laying the foundations for future predictions. The shorter the interval between two explosions in the solar atmosphere, the more likely it is that the second flare will be stronger than the first one. ETH Professor Hans Jürgen Herrmann and his team have been able to demonstrate this, using model calculations. The amount of energy released in solar flares is truly enormous – in fact, it is millions of times greater than the energy produced in volcanic eruptions. Strong explosions cause a discharge of mass from the outer part of the solar atmosphere, the corona. If a coronal mass ejection hits the earth, it can cause a geomagnetic storm. Heavy storms can disrupt satellites, radio traffic and electrical plants. When in autumn 2003 one of the strongest solar eruptions in history was registered, there was a power failure in southern Sweden and air traffic had to be redirected as communications above the Polar Regions broke down. ETH scientists have examined the processes that take place when explosions occur on the Sun’s surface. They were able to accurately reconstruct the statistical size distribution and temporal succession of the solar flares with a computer model. “The agreement with measurements from satellites is striking”, state the researchers in the scientific journal Nature Communications ("Modelling the influence of photospheric turbulence on solar flare statistics"). Hans Herrmann, Professor at the Institute for Building Materials, reveals that the Sun was not actually his subject of focus at all. The theoretical physicist and expert in computer physics has developed a method to examine phenomena from a range of diverse fields. Similar patterns to those in solar flares can also be found in earthquakes, avalanches or the stock market. “Solar explosions do not, of course, have any connection with stock exchange rates“, says Hermann. Nevertheless, they do behave in a similar way: they can interlock until they reach a certain threshold value before discharging. A system therefore does not continuously release the mass or energy fed into it, but only does so in bursts, Herrmann explains. Experts call this self-organised criticality. One example for this is a pile of sand being created by a trickle of sand grains. The pile continues to grow until, every now and then, an avalanche is triggered. Smaller landslides occur more frequently than larger ones. By organising itself around a so called critical state, the pile maintains its original height when viewed over an extended period of time. In the case of solar flares, the build-up of magnetic energy is emitted in sudden bursts. The Sun consists of hot plasma made of electrons and ions. Magnetic field lines extend from the solar surface all the way into the corona. Moving and twisting bundles of field lines form magnetic flux tubes. When two tubes intersect, they merge (physicists call this reconnection), causing an explosion that gives off large quantities of heat and electromagnetic radiation. The affected solar area lights up as a solar flare. The radiation extends across the entire electromagnetic spectrum, from radio waves and visible light to X-rays and gamma rays. Observations have shown that the solar flares’ size distributions show a certain degree of regularity, statistically speaking. “Events can be arbitrarily large but they are also arbitrarily rare”, says Herrmann. In mathematical terms, it is a scale-free energy distribution that follows a power law. Conventional computer models were able to qualitatively reconstruct this statistic size distribution, but were unable to make any quantitative predictions. Any model relying on the intersection of flux tubes and therefore based on self-organised criticality neglects one important fact, Herrmann points out: "the system is turbulent”. The magnetic field lines in the corona do not move in a random pattern but are rooted in the photosphere’s turbulent plasma, whose behaviour is described in terms of fluid dynamics – the science of the movement of fluids and gases. However, calculations based solely on plasma turbulence were also unable to reproduce the occurrence of solar flares in full. Herrman and his team have therefore combined self-organised criticality with fluid dynamics and reached a breakthrough. “We have been able to reproduce the overall picture of how solar flares occur,” the researcher says. Using week-long calculations on a supercomputer, the team was able to show that the model consistently generated correct results even when changing details such as the number of flux tubes or the energy of the plasma. Unlike earlier attempts by other researchers, their results corresponded with the observations in a quantitative sense as well. The scientists draw the following conclusion from their calculations: “The turbulence and interaction between the magnetic flux tubes are essential components which control the occurrence of solar flares”. Demonstrating such temporal-energetic correspondences is the first step towards a prediction model. However, Herrmann warns, “our predictions are statistical.” In other words, they can only predict probabilities, while the prediction of individual events remains impossible.